Acute Medicine at SWBH NHS Trust is a fundamental specialty, which has grown dramatically over a number of years. It is credited by the Trust and critical to the day-to-day flow of the hospital. The Acute Physicians are heavily involved in strategic decision-making and play a large role in leadership, management and education within the Trust. We are responsible for the first 72 hours of care of our acutely ill patients. We look after a range of patients from the very sick, to those who need diagnostics and discharge to ambulatory care and admission avoidance. We house Level 1 beds and have large ambulatory areas as well as short stay units. We deliver prompt senior decision making on the AMUs with continual presence of acute physicians. Acute medicine is a specialty that is critical to the working of our hospital. It is the HUB/ENGINE of the acute Trust. To create stability and safe care we strive for ownership, control and leadership of our units by acute physicians. Acute Physicians are responsible for the care of all patients on the AMUs and with the help of general physician colleagues we are able to provide this. Acute Physicians are able to provide 60 per cent of the acute care – whilst general physicians provide 40 per cent of this care (majority out-of-hours). Once our complement of Acute Physicians increase we aim to provide further work out-of-hours including weekends. Please contact Dr Clare on 07957147749 or sclare@nhs.net for any informal enquiries. We have dedicated acute medical junior medical workforce. From only a handful we have grown to a large number. On City Site we have 3 SpR’s, 1 ACCS, 1 BBT, 5 FY2 and 3 FY1. On Sandwell site we have 2 SpR’s, 5 SHO’s and 3 FY1’s. We have recently appointed 4 middle grades to support the provision of acute medicine and ambulatory care. Our nursing staff include matrons, ward managers, nurse co-ordinaters, Band 6, Band 5 and Band 4. We have 1:6 nursing for our Level 0 patients and 1:2 nursing for our Level 1 patients. Majority of our nurses can carry out venepuncture, catheterisation, and ABG’s. We have created the AMAN (Acute Medical Assessment Nurse) role, which has been recognized internationally. This nurse takes GP calls, triages, will carry out basic ABCDE assessment and initiates treatment. We have PGD’s for basic treatment for our patients. We have 6 Acute Medicine Nurse Practitioners (AMNP’s). They are competent in reviewing, assessment and carry out independent discharges. We are very proud of the weekend discharge work this team has carried out since the early 1990’s- one of the first in the country. Our AHP’s are critical to our day-to-day working. Our Rapid Response team (RRT) are based on the AMU and vital in getting our patients home, to intermediate care and providing the necessary physic and equipment. Our social workers are also based on the AMU and pick up patients on assessment. We work integrally to ensure prompt access to social care. Our pharmacy team are based on the unit ensuring discharges are prompt and safe prescribing occurs. Other individuals we work closely with are Clinical nurse specialists within respiratory medicine, acute oncology, heart failure, diabetes and palliative care. City Hospital is based five minutes from the City Centre and serves one of the most deprived communities within the UK. A recent study on the AMU showed 60 per cent of patients on the unit did not speak English, revealing the medical take can be a challenge. With a high population of immigrants, a large number of ethnic minorities and low social status we see high levels of acuity, co-morbidities and dependency. Pathology is rife with high levels of TB and HIV. The Acute take is approximately 50 over a 24 hours period. Sandwell Hospital is based within the Black Country and patients are of an older, frailer population with multiple co-morbidities. The population are often described as “salt of the earth” and are eternally thankful and grateful for the care they receive. Re-admissions are high and that challenge may be attributed to the frailer community we are serving. We have very close relations with our specialty colleagues who provide an “in reach service” when required. We have particular strong relations with the Emergency Departments (ED), ITU, cardiology and the frail elderly team. Our Sister colleagues are critical to the way we work and vice versa. The figure below does not represent our entire Sister colleagues. We have abolished all formal clinics and have created virtual clinics, which aim to provide a robust safety net for patient discharge. We have been highly recommended by SAM for this innovative clinic. Our units discharge between 60-65 per cent daily and the virtual clinics are key in providing follow-up for those awaiting results. We have been practicing ambulatory care since the inception of acute medicine and 18 months ago joined the national ambulatory care network which supported delivery of formalised ambulatory care. This area is going through expansion and we have been commended on our environment by the national AEC team. There are 24 established ED to Ambulatory Medical Assessment Area (AMAA) pathways ranging from syncope, upper GI bleed to chest pain and headache. These aid the ED team to refer into the AMAA system and are key for patient experience. The ambulatory day care units are based at City and Sandwell Hospital. Our aim is to treat patients who have been directed through from Accident & Emergency or as early discharges from the Assessment Units or Medical wards. If patients are mobile and have specific conditions, they may be sent to the AMAA rather than having to wait in the Emergency Department. 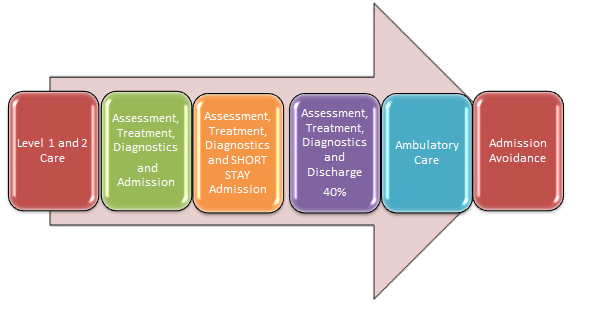 The AMAA is also designed to help achieve early discharge whereby patients in the assessment areas may be discharged early and return to the Ambulatory Area to have subsequent treatment and/or investigations, which may have required them to stay as an inpatient otherwise. This is preferable, as evidence exists which suggests that patients who are recovering will do so more effectively, if supported in their own home. The service is staffed by a dedicated team of consultants, doctors, advanced nurse practitioners, staff nurses and healthcare assistants and enables patients to be seen more quickly. All patients must be referred and clinically accepted by the ambulatory emergency care team. The unit is focused on providing the right care for our patients, in the right place. Patients discharged from acute medical wards with outpatient investigations requiring review and possible further intervention. This is a day-treatment service so patients may be required to come back the following day. The units are operational both sites seven days a week from 8am – 8pm this will be reviewed soon with a view opening until 10pm. Ambulatory Unit at Sandwell Hospital is located above the Emergency Department and City Hospital is located on the ground floor in the Acute Medicine Unit. The units are operational both sites seven days a week from 8am – 8pm. The opening hours will be reviewed soon with a view of opening until 10pm cross site. We discharge on average 60-65 per cent home from our AMU’s. The national average is 40 per cent. This has been attributed to the creation of virtual clinics, daily walk in reviews, ambulatory diagnostics slots and most importantly acute physicians running and leading the units. We work in line with the national SAM standards. Our audits reveal patients will be seen and reviewed by Acute Physicians on average within 4 hours of patients hitting the AMU. We measure our KPI’s and are working well within national recommendations. We have dedicated USS machines on both units, which enable prompt diagnostics at the front door. We are responsible for carrying out procedures on the AMU’s. This has shown to decrease LOS, ensure prompt diagnostics, increase discharge rates and importantly improve patient experience. As we have trained Physicians in USS we are the mots popular rotation for acute med trainee’s within the West Midlands. We aim all trainees’ to achieve FEEL/FICE by the end of the year as well as achieve adequate numbers for thoracic USS. AMAN (Acute Medical Assessment Nurse) role has been recognised internationally by SAM. We deliver AMAN training days and ensure we train and invest in our nurse workforce. Education and Training is a key component of the department. We deliver IMPACT (Ill Medical Patients Acute Care & Treatment), USS at the Front Door, Golden Hour Training and AMAN Training Days. We are the most popular training job for foundation doctors. “The nicest people I have worked with”, “ The support I received has made me a confident doctor”, “ A unique team”. Numerous local, national and international publications, posters and presentations. This year at SAM Manchester 2015- 6 junior doctors from our cohort presented posters. Please review our publications library. 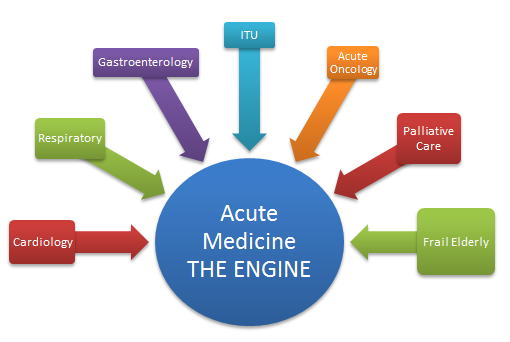 AMU is adjacent to ED, Radiology and Cardiology with ITU directly on top with a dedicated lift from AMU to ITU. Dedicated AMU Clinical Skills Lab ( the first in the UK). Nursing, medical staff as well as students will get the benefit of “teaching on the job”. Rapid Response (OT/Physion) based on AMU. Dedicated working space for junior medical and nursing staff. Our job plans within acute medicine are critical for sustainability. We are a specialty which is intense, with high acuity and often working under intense pressures. Balance is key. Everyone with the department who would like a specialty session is honored this. For example, Dr Clare carries out an “acute echo clinic”, Dr Usman an endoscopy session, and Dr Patel a poisons session. Every member of the team have taken on roles and titles within the department ranging from education lead to mortality and morbidity lead to audit lead. Everyone has a dedicated session for admin and we are given the opportunity for supervision. Our job plans are always carried out together- ensuring equity and transparency. We are a young team all trained and passionate about acute medicine. The team is vibrant, young, driven and we have a family “code of conduct”. With monthly Consultant meetings we have created a team that is strong, resilient and always looking and ready for the next challenge. I graduated from Manchester University and carried out my training across the country. I was appointed as the first acute physician at City Hospital in 2009 and have been pivotal in setting up acute medicine within the Trust. I have a Masters in Medical Education and I’m accredited in echocardiography. I have created and delivered many courses including “Stroke Thrombolysis”, “USS at The Front Door”, IMPACT and the AMAN course. I have led, created and delivered many new services from acute echo clinic, provision of USS on the AMU’s to revamp of medical rotas. I have recently been appointed as Midland Met clinical advisor, which is an extremely exciting role as it involves change management towards progression of the opening of the new hospital. I also recently led the respiratory team to deliver a seven-day service. On a personal note I am noticeably an energetic individual who thrives on the next challenge. I love running, HIT workouts and dancing- with flamenco being my new skill. Having run the London, New York and Paris marathons I aim to run all world top 5. However, my most important job/role is being mummy to my two young boys. I am the clinical director for emergency care, which includes ED, acute medicine and toxicology; I also oversee hospitals at night and emergency mental health. Prior to this I was specialty lead for acute medicine for two years. I am proud to be part of this team of acute physicians; our team has consistently performed well above KPI’s, in some instances like same day discharges we perform at least 100% above our KPI. The acute medicine team is the most efficient team- with falling sickness absence and our AMU’s are consistently under spending in this climate where most areas are overspending massively- all of these hallmarks are of an efficient cohesive unit managed very well and very productive. I graduated from Bello University in Nigeria where I worked for a short period and then moved to the UK. I trained within general medicine with Norfolk and Norwich University and then moved to the West Midlands and trained within acute medicine with specialization in endoscopy; I was lucky to be trained to accreditation level with JAG. My current work is a mixture of leadership, acute medicine and endoscopy. We are a very cohesive team with similar passion for acute medicine, we do not wait for directives, and we solve our problems before others notice them but at the same time support each other. All of us have children of school age and understand that life can throw all sorts at us. My spare time is taken by my two young girls. I graduated from the University of Birmingham in the year 2000 and subsequently trained in general medicine and obtained my MCP (London) in April 2004. I decided to train in Acute And General Internal Medicine within the West Midlands achieving a CCT certification in November 2010 including an overseas training in Anesthesia and Critical care in Sydney, Australia from 2008 – 2009, completing the post grad diploma in medical toxicology. I have been working in acute medicine at SWBH since November 2010 and additionally the West Midlands Poisons Unit since 2012 (contributing to the Clinical Toxicology on-call service). Outside interests include sport, both watching and playing, travelling and generally being besotted by my infant son. I graduated from sunny Southampton and worked around the UK before starting to train in acute medicine in the West Midlands. I was appointed in 2013 at the SWBH NHS Trust. I work with a great “family’ of colleagues who have been a pillar of support and growth, especially in my early years of being a Consultant. Work can be quite intense when we are short staffed but I thoroughly enjoy my work as it gives me immense satisfaction. My areas of special interests are management and information technology. In my spare time I like learning new skills and at present learning to code. I love vegetarian food, yoga, some tranquility, and pretend I am a good bowler when playing cricket. I am an eternal optimist, which can be a little unhealthy for oneself! I graduated from the University of Wales College of medicine in 2000 and moved to the West Midlands where I began my medical rotations. I was one of the first trainees appointed to the Acute medicine specialist training programme in the West Midlands in 2005 and was involved in the initial curriculum design and setting up clinical rotation for Acute Medicine Trainee’s. I have worked across the West Midlands and as a part time trainee have been heavily involved in developing the specialty of acute medicine. I was appointed as a Consultant in February 2015 and have taken on many roles and responsibilities, which includes Lead for the Emergency Care Directorate mortality and morbidity meetings and overseeing the training and education for the nursing staff and nurse practitioners in the Acute Medical Unit. I am a firm teacher for the undergraduate medical students and participate in the teaching programme of Core Medical trainees. I also have accreditation in FEEL (Focused Echocardiography in Emergency life support). I have four young children and work part time to juggle work and a busy home life. In my spare time (if any!) I love to cook, and read. I am also a regular at fitness classes and actively involved in my local church activities.